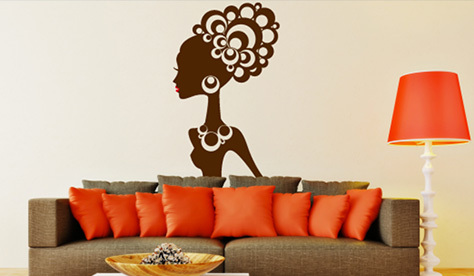 We have prepared a wide range of unique vinyl wall stickers which will revive your room unique design. We are direct manufacturers stickers on the wall, so we can offer our customers the lowest prices. Thanks to our long experience, we have developed a broad portfolio of designs and colors from the finest materials. Our stickers are characterized by their high quality and workmanship. topSamolepky.cz shop offers a unique feature where you can choose the sticker in a certain color and test how it would look right in your room. Most labels also you can choose the size, calculate the price and directly to the cart. Vinyl stickers can be placed not only on the wall, but also doors, windows, mirrors, cabinets, refrigerator, tiles and other surfaces. If you have any questions, you can contact us at any time. Satisfied customers are our top priority. Decorative vinyl wall stickers are becoming increasingly popular fashion hit many dwellings, households and offices. Self-adhesive wall decorations can conjure up the unique atmosphere of the interior. Proper choice of interior decoration animates, gives him a charge, individuality and determine its style. Wall stickers are very popular, especially because they will show their own creative approach of the author - the owner of the interior. Up for grabs are different designs, colors and sizes. Stickers are flexible, they can be stuck almost anywhere. They can be reused when removing destroys the substrate wall. Before you select a particular decoration on the wall, it is advisable to clearly outline everything or use our unique design tool to design your room. Your sketched ideas you might show some weaknesses, and you will find in time what is where to avoid. As a general rule: choose two to three colors Fit together, one of them should be dominant, and the rest should look dotvářet and tune. 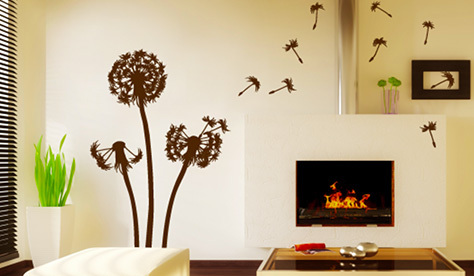 Bonding decorative wall stickers is easy and everyone can do it easily. Sticker no problem holding onto a smooth, clean surface (the smoother the surface, the better, of course, holds sticker). Self-adhesive decorations are designed to be stuck on the wall, tiles, furniture, glass, various plastics, smooth wood and metal. If you have freshly painted, it is advisable to glue wall stickers rather wait a few weeks before the wall is sufficiently dry. Also, we do not recommend placing self-adhesive decorations away from sources of heat (eg fireplace, radiator, cooker) and the structural painting. Selected location for decorative sticker is the sticker prior to the application to be cleaned of dirt, dust and grease. If you use the water, wait until dry place. Wall stickers will last for several years. Mostly, however, becomes the sticker its owner tired before it would be removed due to wear. If you decide for any reason to remove the sticker from the wall, you can do so without without wall or. painting damaged. Attention only the peel stickers of the old wall, can sometimes peel off the top layer of the painting. However, if the surface is coherent and nedrolí can peel off sticker and reused. 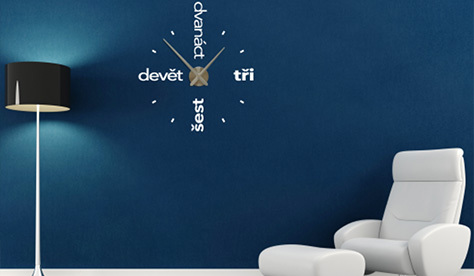 Adhesive decoration is therefore possible to stick more than once, however, depends greatly on the substrate. 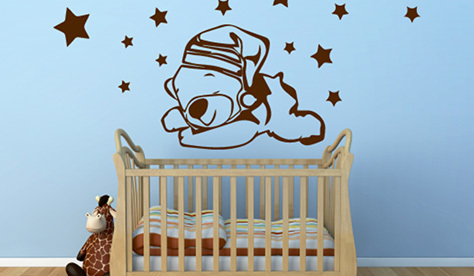 Vinyl wall stickers are waterproof and can be washed with a damp cloth. No need to use any special cleaning products and even this is not recommended due to the potential disruption color stickers.